Great use of negative space. Stay warm. Thank you, Dan. 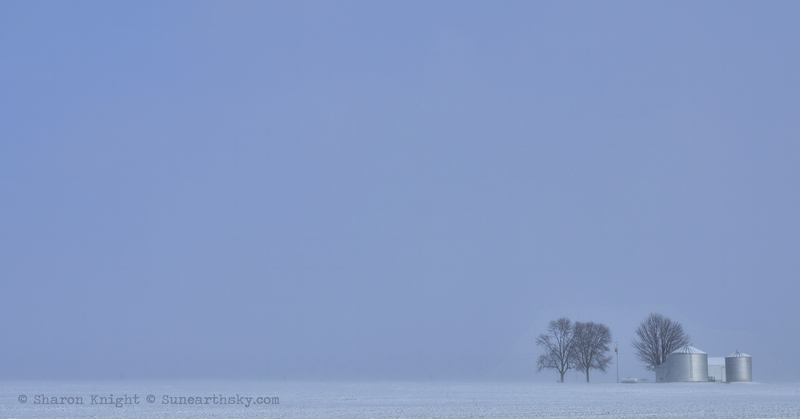 I love the restful feeling from negative space which is good because there’s plenty of it in the Midwest :-). Still zero degrees in Illinois this morning but I don’t mind :-). Agreed; i get the same sense. I need to shoot more negative space. Wonderfully minimalist….perfect for the day I took down all the Christmas decorations and clutter! Aw, thank you Seonaid. And Happy New Year! We took ours down New Years’ day. Much as I love Christmas decorations, it’s always a good feeling to get the house back to its normal state, isn’t it? I love your composition and negative space. I love winter and this depicts “winter” to me. Thank you very much :-). What a lovely comment :). Happy New Year, lovely to see your photographs again – this is a winter beauty. Thank you, Mary :). Happy New Year to you as well. Great shot. I like it very much. Thanks. I love the huge sky, where you placed the horizon line and the silos and trees so small against that sky. Great picture!